It turns out that 42 administrators at SIU-Carbondale are listed as “interim,” from the president on down. Click here for the chart. It’s insane. 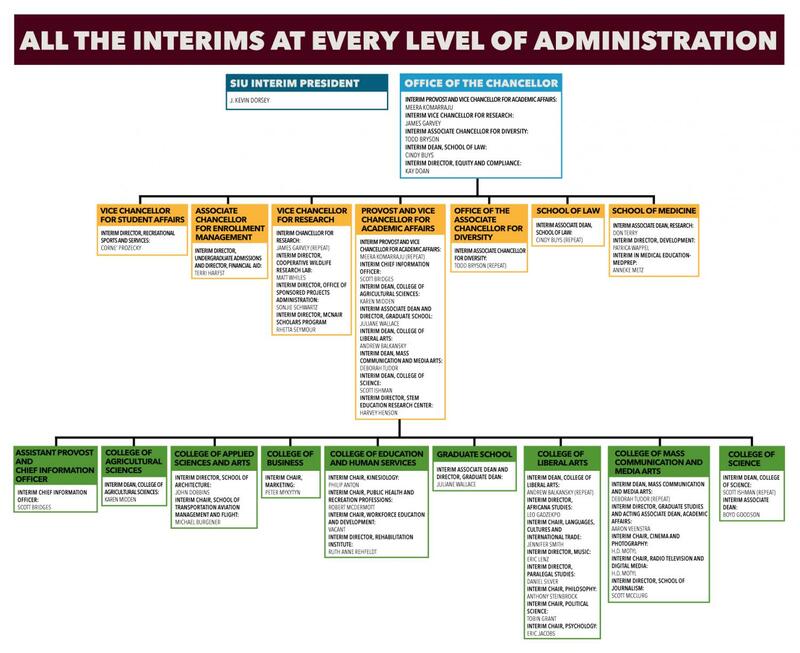 And that chart was made before the hiring of SIUC Interim Chancellor John Dunn in December. College of Mass Communication & Media Arts’ acting Associate Dean for Academic Affairs and Interim Director of Graduate Studies Aaron Veenstra said one of the reasons SIU has so many interim positions for administrators is the university lacks hiring power. If everyone who is interim wanted to hire somebody to be the head of a school, the university would be required to do a national search, Veenstra said. “But we can’t hire anybody,” he said. Employees in interim positions of department faculty and administrative staff hold positions that are not permanent, SIU spokesperson Rae Goldsmith said. “Typically, interim positions are no longer than one year, although we do have a couple now that are multiple years,” Goldsmith said. That place has lacked any semblance of stability for years. This has to come to an end one way or another. Southern Illinois University could establish a presence in downtown Springfield under a plan introduced in the legislature today by State Senator Andy Manar. Um, isn’t that the University of Illinois-Springfield gig, right now? Just like a politician. Dump more money into a dying entity. I was going to post the same thing Word. UIS. Doesn’t UIUC have a satellite campus in Springfield? Why the push to bring another university satellite campus to Springfield? Agree with prior posters. UIS should have geographic exclusivity for public universities in Springfield. Sure, SIU should have tons of branches, one in Carbondale, Edwardsville, Springfield, Champaign, DeKalb, Charleston and Macomb. What could go wrong? Attacking the universities outside the U of I System is going to be critical (besides fully funding them, but…) in moving forward with a healthy higher education system, with all viable. Having SIU in Springfield in this proposed capacity isn’t helping. Then there’s these interim issues with SIU. Be bold, look at higher ed with an eye to save it and make it better. A couple in Chicago would also help. They have slept on that for decades. Should everyone else continue to wait? The problem starts in the President’s Office. The last two wanted to call the day-to-day shots in Carbondale and did anything and everything to put their people into those administrative positions or get their people on the Board. If they got in, the opposition kept battling on until a resignation or demotion. The cycle then repeats. By now it’s a cultural problem. Actually SIU has a campus in Edwardsville. I graduated from it. BTW Rae Goldsmith is also the interim vice chancellor for development(runs fundraising and the foundation. With the Med School and the merger of WSIU with the local PBS station SIU already has a bigger presence than the U of I. The UIUC Law school won’t “allow” UIS to have a satellite program anywhere else. And there is no part-time option. I personally know of a lot of mid-career professionals who would be willing to do law school on an alternative schedule like nights and weekends in Springfield if that were an option. It wouldn’t matter to me whether it was UIS or SIU, if it was affordable and convenient. Whether a $50 campus is necessary to do that is an interesting discussion. Just move the law school to Edwardsville. It would attract more students and better internship opportunities. I don’t see the need to encroach on Springfield. The days of students being attracted to rural universities is ending. SIUC doesn’t need a gimmick. It needs funding. It needs to be able to have tuition priced competitively that is reflective of the education received at the university and the student body it hopes to draw. You also can’t expect to hire folks that are worth retaining in the long run with a national search for academic positions where it’s very clear the University is in trouble, and they also expect faculty members to pay out of pocket for basic things like conference participation. Professors there don’t even get some basic perks like free access to the SIU Rec. How do you hire and retain folks when it’s pretty clear they’re going to get nickled and dimed the whole time they work there? U of I Springfield has been a failure when it comes to post-master’s and professional programs in the Springfield area. It’s ridiculous that the Springfield, where laws are made, doesn’t have a law school. Manar’s plan to save SIUC is to expand it outside of Carbondale? How is that going to help Carbondale, the SIU system and the economy in deep southern Illinois? Hey you UIS aplologists, there’s this thing called the SIU school of medicine in Springfield, right off downtown. And exactly what is UIS’s leadership role downtown? I realize Springfield hates change, but cmon. And a shrine to bureaucracy, no less. Prove you can maintain what you have before expanding. I’m no expert but how do you allow a university to lose 1/3 of its students and not do anything? In 1991 the school had 21,000 students and now it has 14,000. It’s like watching a ship slowly sink. As far as a location, there is the now empty Benedictine Univ. on the north side of Springfield. SIU had explored the option of having a satellite school in Springfield but the U of I beat them to it when they took over Sangamon State. SIUC has many problems, some perhaps self-inflicted and others caused by our great state that has put itself in the situation it now finds itself. The issue of Higher Ed in Illinois is much larger than this one campus, but this is not the solution. The Paul Simon Institute is a remarkable entity that does not have to be housed in Springfield. A piecemeal approach to revitalizing Higher Ed will never work given the problems many of the Regionals are experiencing. Several previous Governors probably needed a law school conveniently located near the Governor’s Mansion. UIS does have a rather limited curriculum and it would be nice to see offerings in Springfield above the Master degree level. Great idea by andy. besides, illinois has plenty of money to pay for it. SIU has had its day and served an important purpose. Buggy whips had their day and served an important purpose. It’s time to recognize there is no saving SIU now. Let it go. So Manar wants to put a SIUC satellite in Springfield . . . sure to be a smashing success, just like WIU’s Quad City campus, right? But that’s not wrong. There should be one there. That said, the history of Springfield is filled with blunders. Hmmm, which should we choose, the land grant university or the state fair? Then the town gets a makeup call and what do they do? Put UIS (then-SSU) out in the boonies instead of downtown. Comedy of errors of their own making. The damage to SIUC has been self inflicted. It’s a management problem. Before any money is allocated there has be to a change there. If not you’re just throwing good money after bad. Sounds like the SIU policy center in Springfield duplicates what is already in Springfield (UI-S) and next door in Champaign (UI). I’d take that money and invest it into something that will recharge the economy - like completing the almost completed WIU-QC riverfront campus that will boost the state’s engineering students as well as the workforce of John Deere and other regional powerhouses. Or take that higher education money and ramp up the SIU-E effort to boost advanced manufacturing in the Metro East, which has strong manufacturing roots. Sorry Carbondale, the end is here. One other thing that a downtown location next to the Governor’s mansion doesn’t have: Where you gonna park? I agree with A Jack, those who are poo-pooing another Springfield SIU campus apparently aren’t from Springfield. SIU Springfield School of Medicine has been a great success by any measure. To the naysayers; what’s the benefit of having no law school in Springfield? If Abe Lincoln had a law school in the area, he wouldn’t have had to teach himself. I always thought Wisconsin had a good system. Both 2 year and 4 year are called University of Wisconsin at whatever. There is one board and all credits transfer from one school to another. Most schools in Illinois push 5 year programs, especially for transfers. Seems to make sense to have the Chicago universities, NIU, ISU, UIUC, UIS, Eastern and SIUE. Sorry SIUC and Western, you don’t make the cut. What we need certainly is not more lawyers. Carbondale and Macomb losing their economic engines? Wonder why no one is suggesting to close universities? Why did Rauner try to do it passively? Easy answers are never either. Why build a new building when downtown has plenty of vacant ones, also Benedictine is still empty? There was a good reason to put UIS out in the boonies. Out there it has room to grow and expand. There is no place to park for students or faculty. You’d be locked into a limited amount of space and no place for a dorm of any kind. This naysayer wasn’t saying there shouldn’t be a law school in Springfield. Just put it under UIS instead of SIU. Yes the medical school is grandfathered in as far as I am concerned, but anything new that goes up in Springfield should be governed by the UI system. The tough part is Eastern, Western, and Southern should either merge to have offerings that aren’t overlapping or they should close. Students have a choice. They don’t choose these schools as much. Yes, bad news for Charleston, Macomb, and Carbondale. Or, bad news for the rest of us? Time to make the tough decisions. OW is correct of course, Rauner had the right idea, just a coward by not saying what should be done. He tried to have them die on the vine. The long term cost to operate these 3 universities is not worth it. I graduated from one, so I am not happy to admit the reality. The reason UIS is in the boons is because Springfield doesn’t want to be a college town. UIS does not have nor does not want a law school. SIU has a law school and is willing to do this. Don’t take my word, try to sign-up for UIS law degree program or UIC - Springfield. Be honest what you’re proposing is to kill the Springfield law school idea. Thanks for speaking for Springfield. Is SIU med school in the boonies. Who opposes that? West Wing is obviously not from Springfield. This is as bad as deep Southern Illinois professing a detailed knowledge of Chicago. - Given some of the ignorant comments on this thread, I think we have MAGA version of Springfield going on MSGA? Been There, a little difference between downtown Chicago and downtown Springfield. Great opportunity for JB and super majorities to help EIU, SIUC and WIU. Each campus makes a difference for thousands of students, faculty and staff and the downstate economy. The lord of the flies higher ed policy offered by some of the peanut gallery here seems short sided and elitist to say the least. When what was then SSU opened its doors in 1970 it was supposed to become a city within a city and home to 18,000 students by now. The study for the supplemental freeway system projected population of 15 million in 2000.A lot of our planning had assumptions like that.I don’t want to join the negative peanut gallery but the demographics just are not good for some things. We need to focus on increasing prosperity for an aging shrinking population. That does include especially higher ed. But if we are not realistic we could find ourselves with sudden failures at our small privates and huge deficits at our publics. Answer, We don’t need more lawyers and another law school. Public universities in Illinois are really in bad shape. The money, if any, needs to be put in existing campuses. Who is “we”? MAGA folks? How many law schools are there in Springfield now? Right answer is: Zero. A campus is different from a curriculum. Maybe Il is in bad shape because so many people downstate don’t have access to proper legal education. And no - Ignorance is not strength. ===Been There, a little difference between downtown Chicago and downtown Springfield. Obviously. But my point was that if they can find room to grow in Chicago which is a denser and much more expensive city then SIU should have no problem expanding in Springfield or finding space to build a dorm. Kudos to Senator Manar for having vision and the courage to put effort behind it. It is easy to be critical but much harder to actually try and do something. Given the oversupply of young lawyers these days, I don’t think we need another law school anywhere in Illinois. Just because someone has a law doesn’t mean they are a practicing attorney. A law degree is largely a requirement for top executive positions nowadays. Regardless of you opinion of “too many” lawyers, isn’t it odd that Springfield folks have no opportunities to receive a legal education? You had people running agencies under governor Quinn that didn’t understand that state agency policies they created superseded federal law. Constantine Hatziadoniu needs to be fired. That con-artist cost me $10K in private student loans. Having grown up in Springfield, I found it mind-numbingly boring as a teen. Our only activity was to drink beer on the country roads outside of town and get in trouble. Couldn’t wait to leave. What I wouldn’t have given to have the activities and ecosystem of a college in town. SSU had none of it at the time and only a little now. If the need exists for another law school or other college, why not? I agree that it should be UI though, since they are already in town as a 4 year institution. Want to throw money at SIU? Double the size of the med school. We actually need more doctors. Why is dorm so important? Apartments nonexistent? @Anonymous and @ Ron Burgundy I call BS on your UI & UIS diversions. Everyone knows that there is no UIS accredited law degree program and that UI has declined to bring this post-grad program to Springpatch. You think UI wouldn’t start a law school in Springpatch if you gave them $50M? It would at least give them a few years to stall it off for 6-8 years while they develop a program and a few more years to get accredited. So they may accept your plan to let the idea languish for 8 to 10 years. Go ahead and propose it to Manar. Duopoly…Sorry, I don’t have a dog in the hunt, nor will I argue that UI wants a law school in Springfield. Personally, I’d first like to see a business case for a law school in Springfield or Edwardsville. However, if you have $50M burning a hole in your pocket and want to give it to someone for the dedicated purpose of a law school in Springfield, SIU just doesn’t make any sense relative to UI. Again, do something useful and give it to SIU and double the med school. How about saving some money and just having one system. Simple fix has the answer, but it does not involve just saving money. There needs to be a statewide governing body that is not peopled with Trustees who are appointed just because they are mega political donors who want dedicated parking spots for pre-game tail-gating. There needs to be an overall plan for all Illinois universities. I am hesitant to suggest the need for a high-powered Commission to study the issues and make recommendations based on facts, rather than solely on parochial interests, but maybe we are at that point because of decades of ignoring the various realities, including demographics, funding, etc. Illinois should absolutely be going to one system. An argument could be made for UIUC being on its own, but having as many different boards as we do is nuts. Not every university should be in the U if I system. * University of Illinois - Chicago, Springfield, Urbana-Champaign. Three universities. * Lincoln University System - Three pods, Three universities in each pod. Three pods, allowing a grouping of each with the universities facing, arguably, similar challenges. Making “Edwardsville” part of the U of I umbrella makes no sense, especially if the talking point is location/geography. You can restructure to two systems to help them all. @Willy - I remember you suggesting this reorganization a long time ago and remarked that it was a creative resolution to the problems that Higher Ed was going through. Each of those entities needs to be preserved but appear to be working against each other and none are really succeeding as they could without a clearer vision and mission. Huge hurdles to overcome here, but the options must be carefully studied. The easy part is the suggestion, to get the Lincoln University system and these pods up and running… the work would be historic and at times seem impossible… but something needs to change, something needs to break to build, and it saves all the schools, on its face. I would like to see (1) some evidence that a law school would be viable in Springfield; (2) some evidence of how a new law school would affect other similar public law schools (SIU-C included); and (3) an argument why SIU-C is the choice to run such a law school, including an analysis of the financial viability of the existing school and the quality of SIU-C’s school (which is in the lowest tier of law schools).